Mathematical skills and concepts lie at the heart of chemistry, yet they are an aspect of the subject that students fear the most.Maths for Chemistry recognizes the reality of chemical education today, and the challenges faced by many students in equipping themselves with the maths skills necessary to gain a full understanding of chemistry. Working from basic yet essential principles, the book builds the student's confidence by leading them through the subject in a steady, progressive way from basic algebra to quantum mathematics.Opening with an introduction to the 'language' of maths and fundamental rules of algebra, the book goes on to cover powers, indices, logs and exponential functions, graphical functions, and trigonometry, before leading the student through both differentiation and integration and on to quantum mathematics. With its modular structure, the book presents material in short, manageable sections to keep the content as accessible and readily digestible as possible. 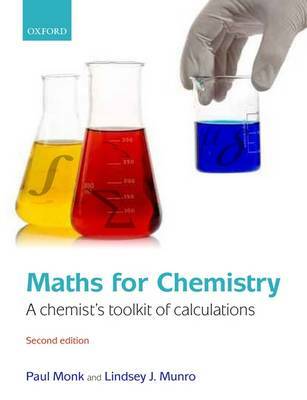 Maths for Chemistry is the perfect introduction to the essential mathematical concepts which all chemistry students should master. Monk, Paul; Munro, Lindsey J.; Monk, Paul; Munro, Lindsey J.